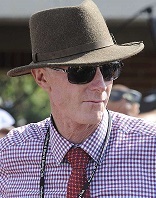 Danny Williams has been asked countless times for a pecking order among his nine runners in the $150,000 SERA Country Championships Qualifier (1400) at Goulburn on Saturday. He understands why, especially as trainer of the hot favourite, but says his priority is to the owners of those nine horses and ensuring each races to their best. In a remarkable achievement, Williams will be represented by Pumpkin Pie, Kopi Luwak, Acquittal, Mister Marmalade, Chewbacca, O'Lordy, Volpe, Biodynamic and of course Don't Give A Damn. The barrier draw possibly left the door ajar for an upset with Don’t Give A Damn coming up with gate 16. "I haven’t thought about which is going to be better than others,'' he said. "I’ve had plenty of people ask me that question, the media, my staff, jockey managers, but I’ll leave that to the judges and the punters. "I don’t want to focus on that and if I did it’s not fair to the other owners. When pushed a little, Williams said on form he feels he has five or six live winning chances but wouldn't begrudge any their chance as each horse has pleased him in their own way. If one particular horse, though, happened to win it'd be a moment Williams admits he may find hard to cope with. That horse is Kopi Luwak. His story has been well documented, and an interview by TAB's Gerald Middleton with Williams about that story is well worth a viewing. "It’s an under the skin type thing with him,'' he said. "It’s deeper than just having a horse in work or a good horse. We’ve had a lot of hardship and battles to get to where we are. The short version of that story doesn't do it justice, but Williams suffered an injury after being thrown from Kopi Luwak that would give most people a chill or bring a tear to the eye. And that's aside from the remarkable job he did to nurse the gelding back from a tendon injury that was one grade off tearing completely. "He’s such a character of a horse in many ways,'' Williams said. "There’s good and evil in him. He’s such a powerful horse, you’d go out on him and be thankful you came back safe. "He’s such a playful big rooster. In the early days he bucked and for quite a while you’d have to ride a pony around with him to keep his head up. Thankfully Kopi Luwak has a career as a racehorse but the build up to his Country Championships bid has still had its share of drama. Williams elected to miss a Highway race at Rosehill three weeks ago due to a rain-affected track and to split him and stablemate Acquittal up. 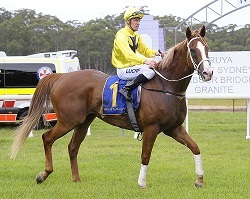 The pair had clashed in a Highway on January 20 and Punters Intel revealed Kopi Luwak was the only horse to break 34 seconds for the last 600m running 33.85. Kopi Luwak and Rory Hutchings after the gelding's emotional win at Moruya off a two year absence. (Pic: Bradley Photos). He was due to run four days later at Randwick but a mishap in the truck forced his late scratching and Williams has had to keep his fitness up without a race for more than a month. "We put the tailboard down and noticed he’d hit his head,'' he said. "When we opened the back it was quite evident he’d hit his head because there was blood around. "He’s got loads of ability but hasn’t had a great lot of luck lately. He hasn’t had a run for over a month, it’s not ideal because he’s such a big horse. "What’s worked for him as far as his tendon goes is not working him too hard and allowing him to get fit with very little fast work. Kopi Luwak is one of four Country Championships acceptors, including fourth emergency El Mo, that Williams trains for long-time client and friend June Baker, whose horses run in the yellow with a black maltese cross. Bill Kelly, who owns the import Biodynamic, has been a family friend for some 40 years, Don't Give A Damn's owner Kevin Carmody has had several horses with Williams and there are countless others hoping their horse can take the lion's share of the $150,000. Logistically, aside from managing owners, Saturday's race is going to be a challenge for his stable. Williams can recall having five horses in one race a couple of times but nine is going to stretch things. "We’ve been talking about this and I guess I’m going to be short staffed,'' he said. "If I’ve got nine of the 16 runners then I’m going to have to work it out with the stewards to see if there are other people around to help us saddle. "I’m sure we can get some assistance from other trainers or foremen that are there on the day.